Note: This is a new page that is still under development. Some of the material on the page is incomplete. The history of Milesian coinage during the late-fourth and third centuries BC is complex and many chronological details, especially of the late third-century bronze, have yet to be worked out. Few specimens from this collection are available to illustrate the types produced during this period, but a summary of what is known about the issues of these decades is presented here for reference. The profile-Apollo/standing-lion type that was introduced with the fourth-century Rhodian silver continues in the third century, but under two new weight standards: a reduced-Rhodian standard used for an early didrachm issue (described below), and a Persic standard used for an extended issue of didrachms, drachms, and hemidrachms from about 260 BC onward. The early reduced-Rhodian didrachms were minted in parallel with a small group of profile-Apollo/standing-lion bronzes (also described below), while the later Persic-standard silver was minted in parallel with bronzes of a new type, featuring a three-quarter facing head of Apollo on the obverse. A comparatively rare bronze issue that restored the profile-Apollo obverse may have been minted during a gap in the facing-Apollo series, but its exact placement is uncertain. Included under this heading is the compact group of reduced-Rhodian-standard silver didrachms (about 6.5 g) that Deppert-Lippitz places in her Period III (1984: #436–496, pls. 14–16). The types on these coins face to the left, as in the Rhodian-standard silver tetradrachms, drachms, and hemidrachms of her Period I, but unlike the coins of Period I, the silver didrachms of her Period III always possess an exergue line on the reverse. Specimens naming magistrates ΜΝΗΣΙΘΕΟΣ, ΖΕΥΞΙΛΕΟΣ, ΑΝΤΙΠΑΤΡΟΣ, ΤΙΜΟΘΕΟΣ, ΦΑΙΔΙΜΟΣ, ΒΑΣΙΛΕΙΔΗΣ, ΛΥΚΟΣ, ΠΡΩΤΑΡΧΟΣ, ΑΝΤΙΛΕΩΝ, ΑΝΑΞΙΚΡΕΩΝ, ΤΙΜΩΡΟΣ, ΚΛΕΙΤΟΜΑΧΟΣ, ΠΙΤΘΙΣ, ΜΝΗΣΕΑΣ, ΑΝΤΙΑΝΔΡΟΣ, ΒΑΚΧΙΟΣ, ΕΧΕΒΟΥΛΟΣ, ΑΘΗΝΑΙΟΣ, ΠΥΘΩΝ, ΑΡΙΣΤΟΚΡΑΤΗΣ (corrected from D-L’s ΑΡΙΣΤΟΚΑΤΗΣ), ΛΑΜΙΟΣ, ΜΟΙΡΙΑΣ, ΕΡΓΙΝΟΣ, ΑΠΟΛΛΟΔΟΤΟΣ, ΔΑΜΑΣΙΑΣ, ΜΝAΣΕΑΣ, ΗΡΑΓΟΡΑΣ, ΔΗΜΟΣΘΕΝΗΣ, and ΧΑΡΜΗΣ are recorded by Deppert-Lippitz, and Kinns (1986: 239–240) adds the names ΤΙΜΕΑΣ and ΦΙΛΙΔΑΣ. One example is included in this collection. In more recent writings, Kinns has continued to express a preference for a date in the vicinity of 310–300 BC for these issues (Ashton and Kinns, 2003: 18, n. 81), and his chronology has been adopted here. These issues are known only in the didrachm denomination; no tetradrachms, drachms, or hemidrachms have been recorded. Interestingly, however, the apparently parallel series of didrachms from Samos, described by Barron (1966: 125–140, pls. 23–25) and noted above by Kinns (1986: 252), does appear to have been accompanied by a small number of drachms (3.2–3.6 g), hemidrachms (1.3–1.7 g), and trihemiobols (0.6–0.7 g). Perhaps Milesian issues in these smaller denominations are waiting to be discovered. RJO 89. Silver didrachm (6.33 g), about 310–300 BC. Obverse: laureate head of Apollo left. Reverse: lion statant regardant left on exergue line, looking back at eight-pointed sun; ΜΙ monogram to left; [Β]ΑΣΙΛΕΙΔΗ[Σ] in exergue. This specimen was struck from obverse die V5 and reverse die R9 of Deppert-Lippitz (1984: 161, pl. 14), a previously unrecorded combination which links the strikings from V5 to those from V6. The contemporary 18 mm bronzes: Kinns has argued (1986: 251–252) that a subset of Deppert-Lippitz’s Period II, Series IV bronzes—in particular, those featuring magistrates ΔΑΜΑΣΙΑΣ, ΘΕΑΝΔΡΟΣ, ΤΙΜΟΘΕΟΣ, and ΦΙΛΙΣΚΟΣ, and possessing an exergue line under the reverse lion—are contemporary with the reduced-Rhodian silver didrachms just described. 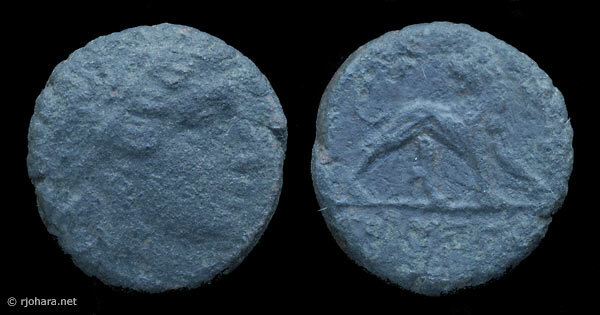 These bronze coins “must be exactly contemporary with the reduced [Rhodian] weight didrachms of D-L’s Period III [above, rather than with the full-weight Rhodian tetradrachms, drachms, and hemidrachms of Period I], for no fewer than 10 of the 14 recorded [bronze] magistrates also appear among the 30 names of that [reduced-Rhodian] silver series; stylistic details, notably Apollo’s elaborate hair-styling and broad laurel wreath, the exergue line, and the occasional use of a sixteen-rayed star all confirm this relationship (D-L, p. 59), and a remarkable case of parallel die sharing in the two metals can now be reported. In the [late group of Series IV] bronze a single obverse links coins of ΛΥΚΟΣ (D-L 379), ΒΑΣΙΛΕΙΔΗΣ (D-L 380), and ΠΡΩΤΑΡΧΟΣ (Kinns; cf. D-L 381), and the same trio are also linked in [the reduced-Rhodian didrachms in] silver (D-L 446–8, all from V6)” (Kinns, 1986: 251). One probable example of this contemporary bronze group (RJO 11) is described for convenience alongside the other fourth-century bronze issues Deppert-Lippitz assigns to her Period II. RJO 11. Bronze 15 × 16 mm (4.17 g), about 310–300 BC. Obverse: laureate head of Apollo right. Reverse: lion standing right on exergue line, looking back at sun (worn or off the flan). This specimen is in poor condition, but if it belongs among these issues it must be in the late Series IV group by virtue of its exergue line.